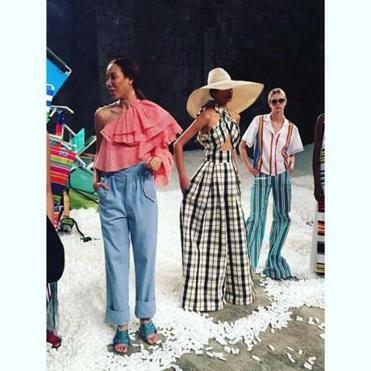 Rosie Assoulin&apos;s Spring Summer 2017 Collection presented at New York Fashion Week. Why is “mom” a bad word? As a fashion blogger and journalist, I love fashion, a lot. Runway shows, magazines, Instagram and Snapchat pics, designers — learning from all of them makes me deliriously happy. But how does one parlay the trends into everyday suburban mom existence? Wait a minute! I am a mom. When did that become a three-letter word? Fashion trends in suburbia don’t change at the breakneck speed of New York or Paris. Top designers are expected to present new collections twice a year, sometimes more. That doesn’t mean moms shouldn’t keep up. How did we go from all empowering givers of life to fashion uglies? Guess what? Some of the chicest fashion magazine editors are moms, and post the cutest pictures on social media of bad braid jobs done by their daughters. Just like us. We in suburbia just need a little help to keep up, especially considering how much we have going on. Here is a little Spring Summer 2017 fashion trend cheatsheet. SS2017 is all about the stripes. Bankers blue and white pinstripe; candy-colored bold stripes; nautical inspired stripes; stripes found in skirts, dresses, wide leg pants, skinny Capri pants, deconstructed men’s shirting, shirt dresses, tank dresses, culottes . . . lots of stripes. Easiest way to bring that to the ‘burbs? Grab a striped bottom of your choice and add a T-shirt. Boom, fashion can be that easy. Sneakers were on all the runways. Great news for moms everywhere! What’s better than slapping on a pair of sneakers and running out the door, knowing you will be both cute and comfortable all day? Just make sure they are predominantly white and somewhat resemble old school Adidas Stan Smiths. This style of sneaker really plays well with dresses. White shirts under slip dresses and maxi dresses were another super easy way to translate trend for SS2017. Someone might want to contact the Gap and tell them to increase production on simple white tees, pronto! A hint of lingerie with an accompanying T-shirt — this is achievable and totally trending. Remember those white sneakers. Colors that are killing it for SS2017 are greens, blues (both light and navy), and creams. Sometimes just knowing the palette is half the battle. An easy way to check if you are on point is to refer to the Pantone paint color of the year. Denim is in! Lighter softer hues but denim nonetheless. Ripped, frayed, belted, jumpsuits, skirts, jackets and plain old denim jeans. The runways of SS2017 had copious amounts of denim. This is very good news for the wardrobes of suburban moms. Just try to break the mom jean trend — avoid the jeans that don’t flatter and don’t have any particular style or flare. Khaki is the queen of the comeback for SS2017. Pair it with hot pink and you will be as dialed in as a fashion editor of a major mag. Wide leg khakis will send you over the top into fully dialed in fashionista. That dramatic wide leg pant is everywhere. Just remember to tuck in your top so you don’t look like a comforter. Let’s bring the beauty back to the fashion descriptive “mom” one season at a time. 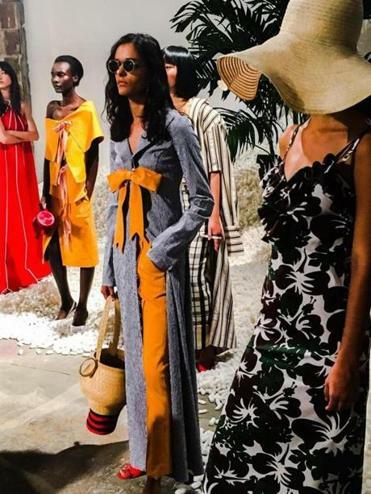 Proenza Schouler tagged its SS2017 collection with “Let your chic flag fly.” What do you say we wave that loud and proud from the closets of suburban moms?